This weekend our special comes from Buck Knives, a repackage of two of their Parallex models in a single convenient kit. If you’re looking for something on the rugged side with a super affordable price point, maybe for a gift, these two knives definitely fit the bill. Aesthetically speaking these are functionally identical, with skeletonized handles that resemble the Gerber Paraframe, built from titanium coated stainless steel. Obviously the single biggest difference between the two is the size. The larger one has a 2.75″ blade and 4″ handle, while the smaller has a 2.25″ blade with 3.75″ handle. The other major difference is in the blade style. While both are hollow ground drop points, the larger knife features partial serrations, while the smaller just has a plain edge. When it comes to the handling my personal preference is the larger model, which feels really ergonomic. The index finger indent and curved shape let it fill the hand really well, and there’s a pretty pronounced thumb ramp up at the top. All-in-all it’s a nice secure feeling in the hand. The smaller one doesn’t feel quite as confident in larger hands, but it’s still perfectly manageable. Their slim profile keeps the knives comfortable in the pocket, with the clips enabling a tight, tip-down carry. Blade deployment on both is handled via the dual thumb studs. It’s not a swift action, and they’re a little difficult to flick out with the thumb, but it’s solid and easy nevertheless. The smaller knife has a slightly more responsive action, making it perfect for a quick middle finger open. The frame locks are a little difficult to disengage, but they at least keep the blades securely locked in place. This week on Spotlight Series we’re going to be looking at the new Vanguard folding knives from Kizer Cutlery. The Vanguard line places emphasis on value, taking some of the best-liked Kizer designs and reproducing them with more affordable materials. The designs are identical and the fit & finish is every bit as nice as their more expensive counterparts, but the Vanguard line repurposes them for everyday carry with prices that you won’t feel bad about using, abusing, or god-forbid losing. The smallest of our three models, and the only one without a flipper, is the V3 Vigor, the knife that sort of made Kizer’s name in the knife world. It’s a really nicely designed folder that doesn’t have any frills or extras, but excels at what it does do. The dual thumb studs provide great purchase and there’s a quick, confident action that makes deployment clean and simple. The blade is a three inch drop point with a hollow grind, reinforced tip, and a hint of a recurve for great slicing performance. Despite having a smaller handle, the hand feel is quite nice. The shape has an indent for the index finger and nests comfortably in the palm for some secure, comfortable handling. The handles are smooth G10 scales over sturdy stainless steel liners. Rounding out the features are a lanyard hole large enough to accommodate 550 paracord and a reversible pocket clip, allowing for left or right side, tip-up carry. Next up is the Kyre flipper, a collaboration between Kizer Cutlery and Czech custom knifemaking team TK Knives, who always strive to balance form with function. The Kyre is a large, vicious-looking knife with a remarkably sturdy build that feels just about perfect in the hand, in either a forward or reverse grip. The deployment action is lightning fast, whether you use the flipper or the large thumb slot. Really snappy and authoritative. The blade is 3.4″ in a drop point with brushed satin finish, and held in place with a sturdy liner lock. The cool thing about the stainless steel liners on this model is that they’re actually inset into the G10 scales, letting the handle be both sturdy and slender and keeping this one unobtrusive in the pocket despite the large size. This pocket clip is also reversible for ambidextrous tip-up carry. Our final knife, the Kane flipper, is the largest and heaviest of these three new models. This one is a design from custom knifemaker Matt Degnan, and with the streamlined blade shape and large bolster it really boasts that custom appearance. The handle is large and thick, so it fills the hand nicely and feels like a hard-use tool, despite the more elegant appearance. Liners and bolsters are stainless steel surrounding smooth G10 scales for maximum comfort. The Kane only has the flipper, no thumb alternatives, but they got the flipper very right. It offers probably the smoothest, easiest deployment of the three, which is no small feat given the competition the others offer. Blade is 3.5″ in a hollow ground drop point, which is brushed satin like the others, and this model also features a liner lock and reversible, tip-up pocket clip. This week on Spotlight Series we’re checking out the Legacy line of USA-made balisongs from Combative Edge. This is a brand new line from Combative Edge and you can’t find these guys too many places, so we’re pretty excited to have them. In contrast to something like a BRS, the Legacy balis aren’t tailored specifically for high energy flipping. This is the working man’s EDC bali-song, if such a thing can exist. The acid washed S90V stainless steel blades are 4.5″ long, designed for hard use cutting, and can be put through their paces while still retaining a sharp edge. 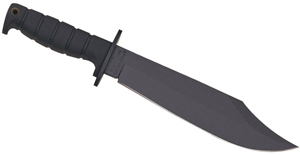 The line features three different blade styles – a bowie, a tanto, and a spear point. The spear point is the coolest looking thanks to its two-tone styling, but the false second edge is sharp enough that you really don’t want to whap yourself with it. Cool as hell, but definitely not advisable for beginners. Handles are rugged G10 scales over thick titanium liners granting a very sturdy hand feel. The texture of the G10, as well as the size and thickness of the handle make this really comfortable to hold and offer a pretty stellar grip. The lock-up is remarkably solid, more so than a lot of other balisongs I’ve handled, letting it feel secure and stable when you’re using it as a knife. The pivots enable a smooth, fluid movement for some nice opening and closing action. If you know what you’re doing with a bali you can have a lot of fun with one of these. This week on Spotlight Series we’re looking at a pair of new Spyderco folders that just came in. When put next to each other our two selections, the Lil’ Lum and the Pattada, could hardly be more different, but they both share Spyderco’s expert craftsmanship and elegant styling. The late Bob Lum was a custom knifemaker whose specialty lied in adapting classic Asian blade styles into modern knives. One of his most popular collaborations with Spyderco was the Lum Chinese folder, based on the classic Shilin Cutter folding knife. This new model, the Lil’ Lum, brings back that design in a more pocket-size profile than its predecessors. The Lil’ Lum was manufactured in Seki Japan, boasting a VG-10 stainless steel blade and textured G10 handle scales over stainless steel liners. The pocket clip, also stainless steel, is reversible for left or right side tip-up carry. Despite the diminutive size, the Lil’ Lum offers a really comfortable hand feel thanks to the extremely curved shape of the handle. There’s some nice chamfering along the top of the blade, letting you comfortably rest your thumb anywhere you want, which contributes to a nice overall sense of control. 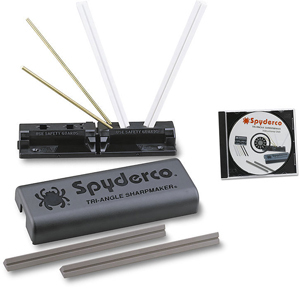 Blade deployment via the Spyderco round hole is as smooth as you’ve come to expect from the brand, but too stiff to flick open with any speed. The blade is 2.38″ inches long with a flat grind and a cutting edge a little under two and a quarter inches. The leaf shape gives you a good bit of belly for some nice cutting power. Our second knife is an all-new Italian-made model, from Spyderco’s series of knives inspired by popular international styles. This knife, the Pattada, is based on the traditional folding knife of Sardinia, the largest island in the Mediterranean. The long, slender design and distinctive blade shape recall the regional styling while putting a Spyderco twist on it. The G10 handle scales have been 3D machined for a smooth, slick finish. The handle is built over stainless steel liners, and the gentle curve and indent near the back make this extremely comfortable in either a forward or reverse grip. With a 4.77″ length, this is a perfect handle for folks with larger hands. Action on this one is much snappier than the Lil’ Lum, making it great for a quick middle finger deployment. 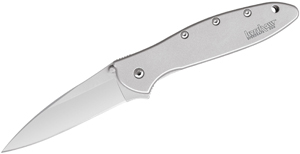 Blade is manufactured from N690Co stainless steel, coming in just a hair under 4″ and sporting a full flat grind. Like the Lum, this blade is locked in place with a stainless steel liner lock.